The definition of a thread is a spiral surrounded ridge structure with surrounding spirals in the round hole or outside of the cylinder. In terms of external threads, the peak of a thread ridge constitutes the major diameter, while the base of a thread ridge the minor. For internal threads, it is opposite. Besides, between major diameter and minor diameter, there is a pitch diameter, as known as an effective diameter whether it is an external thread or an internal thread. The purpose of the pitch diameter is to see if the thread could assemble with its matching thread successfully. If so, the distance between thread flanks will be equal. Because a pitch diameter is crucial to the assembly of the threaded parts, we generally use Three Wire Method or thread gauges for checkups. Usually refers to taper/second/bottoming three steps thread tapping. It uses a thread tap to cut the inner hole into an internal spiral surrounding the ridge. During the manufacturing process, cutting fluid has to be constantly filled in to lower down the temperature and to help residue removal. Applicable when the material is hard or brittle. Compared with thread tapping which uses cutting to remove residue to process with the internal spiral, this method adopts thread tapping and then squeezes to form the internal spirals after drilling the pilot hole. Check out our previous case study for your reference. Applicable to the thread tapping of aluminum or brass made parts of which the threads are with better strength and stability. Identical to thread tapping that internal threading tool is also a method using cutting to process the thread. Internal threading tool has its advantage that it is able to maximize the effective thread hole depth of the blind hole. The limitation of the internal thread tool is that it is unable to process the threaded hole with too small inside diameter. 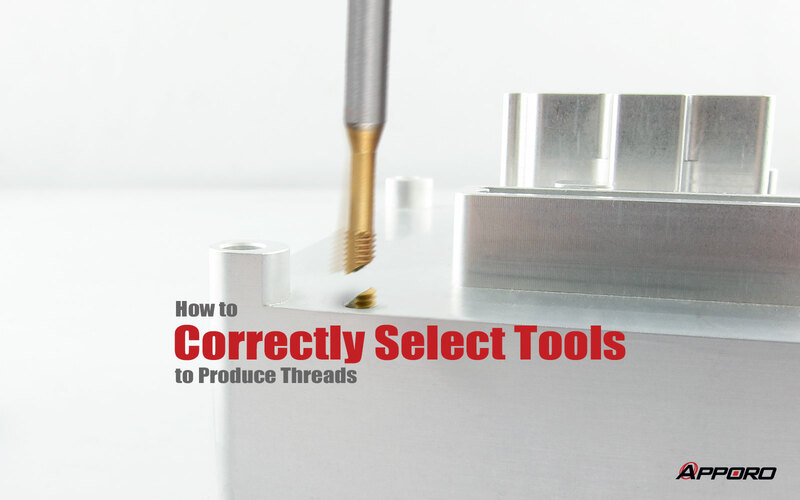 Usually, it is recommended to use thread tapping for threads smaller than M5. Due to the incomplete residue removal of thread tapping process, the tapping breaks in M2 blind hole of the aluminum alloy component. Using fluteless tapping could be an alternative here. Using cold forging to shape the external threads, this method is applicable to ductile materials. Before forming, the outside diameter of the component needs to be processed into the pitch of the thread. 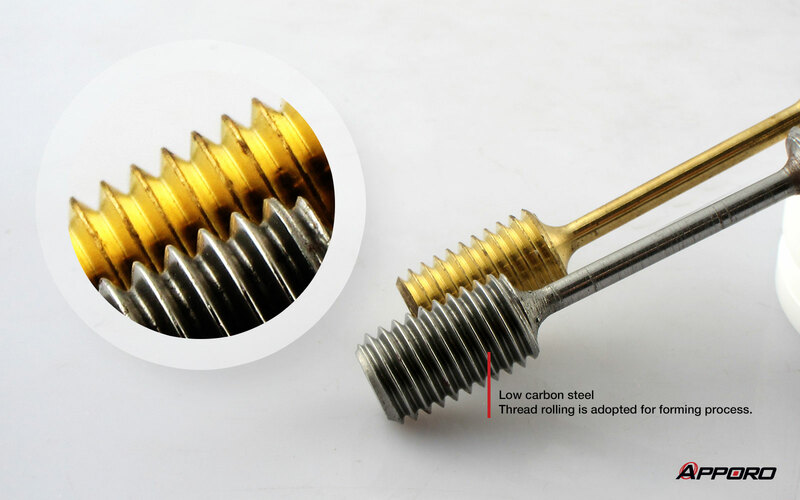 After forming, thread will be complete, precise, cosmetic with high intensity. This forming theory also applies to outside diameter knurling. Take a look at APPORO’s previous case study. Using cutting to remove the residue to process the external spiral. Cutting fluid needs to be added to help lower down the temperature and remove residue. Applicable to ductile and brittle materials. A disc-shaped external thread cutting tool. 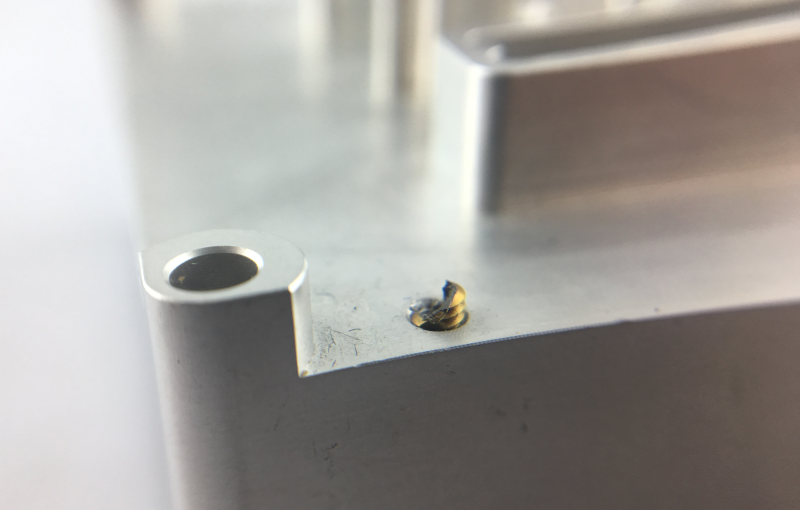 To use the external thread tapping die, the outside diameter of the round bar material needs to be slightly smaller than the major diameter of the external thread tapping die. Also, chamfer at the end of the round bar material will help the process of the external threading die. Using external thread tapping die to produce threads is more efficient, precise, while the tapping die costs more and is more applicable to threads with smaller outside diameter and components shaped like bearing shafts. The low carbon steel component is a piece of demonstrative equipment for tensile force test. Concerning that only with high intensity can threads pass the destructive test, thread rolling is adopted for forming process.